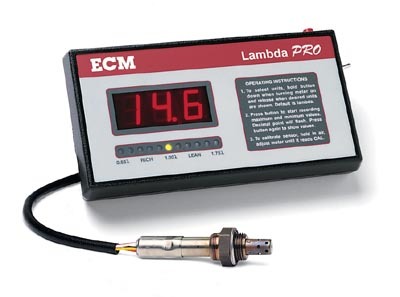 Lambda Pro is the simplest to use of all ECM's air-fuel ratio (AFR) analyzers. Lambda Pro has many of the features of the AFRecorder 1200 but with less programmability. But don't let this fool you, Lambda Pro has "big meter" features such as a linearized analog output, max/min AFR recording, and a stoichiometric SEGO. Lambda Pro is DC powered and comes with a carrying case. SEGO (Simulated Exhaust Gas Oxygen) Sensor Output: Yes. Stoichiometric.